Hubby and I visited Dakigaeri Valley on October 11th. Dakigaeri Valley is one of the most scenic valleys situated along Tamagawa River, a tributary of Omonogawa River, in Semboku City of Akita prefecture. The valley is situated at the midpoint of Tamagawa River and runs for roughly 10 kilometers in total. The valley gets its name from two words namely ‘Daki’ which means ‘to hold or to hug’ and ‘Kaeri’ which means ‘turn around’. Before it was paved as it is today, the pathway along the valley used to be extremely narrow. So when two people, walking in opposite directions, met each other along the narrow path, it was necessary for one to embrace the other and turn around, in order to pass and move to the other side of the path. Dakigaeri Valley is also known as the Yabakei of Tohoku region. Along with Lake Tazawako and its surroundings, Dakigaeri Valley is a part of Tazawako Dakigaeri Prefectural Natural Park. The average altitude of Dakigaeri Valley is not so high. There are virgin forests and waterfalls on the rocks on both sides of the valley. The unique shades of blue color of the waterfalls and Tamagawa River are a beautiful sight to behold. Due to rockslides, the last 7 kilometers of the 10-kilometer path along the valley has been closed off. The accessible sections of the valley has easy-to-walk paved pathway to view odd-shaped rocks, rapids, as well as large and small waterfalls. Near the entrance area of the valley, there is a red-colored suspension bridge named Kami-no-Iwahashi. It is an 80 meters long bridge that was built in 1926, and is the oldest suspension bridge in Akita prefecture. Near the end of the accessible path, about 2 kilometers into the valley, there is a stunning waterfall named Mikaeri-no-taki. From spring to summer, people visit the valley to view the fresh green virgin forests and the beautiful waterfalls of the valley. And in autumn, people visit the valley to view colorful autumn foliage. Next, I will write about a Shinto shrine named Dakigaeri Jinja located at the entrance area of Dakigaeri Valley. It is a small shrine with an old history. Minamoto clan fought many battles with Abe clan during Zenkunen War in Heian period. In 1062, a Samurai named Minamoto no Yoshiie of Minamoto clan wanted to fight a battle with Abe no Sadato of Abe clan of Kuriyagawa no Saku of Morioka. Yoshiie had to cross Tamagawa River to reach Kuriyagawa no Saku for fighting the battle with Sadato. So Yoshiie took out his personal statue of Buddha called Nenjibutsu and prayed at the location of the present-day shrine. He prayed for the river to be calm while crossing it and also for a safe return from the battle. After his victorious return from the battle, Yoshiie enshrined his Nenjibutsu and made a temple at the location. Somewhere along the centuries, many Shinto deities also came to be prayed at the temple. For example, Dragon-God named Ryujin, Water-God named Mikumari-no-kami, and sericulture guardian deity named Kaikogami were venerated since ancient times. In 1673, Dakigaeri Village (present day Wakamatsu in Daisen City) faced severe water shortages and the rivers in the area dried up. So in 1675 a branch shrine of Niukawakami Shrine of Yamato province was established at the former location of the temple and a deity of Water-God named Mizuhanome-no-kami was enshrined inside. The shrine has been rebuilt many times since then. On 11th October, hubby and I left our home at about 10 am. Dakigaeri Valley is located about 85 kilometers east-northeast of our home in Yurihonjo City and it took us 1.5 hours of car ride to reach the valley area. We parked our car at a parking lot and walked for about 350 meters to reach the entrance area of Dakigaeri Valley. While walking, we loved viewing the mountains with green vegetation surrounding the valley. We noted at least three places on the mountains where mudslides had occurred in a distant or not so distant past. Near the entrance area of Dakigaeri Valley, we started walking along a paved pathway. Dakigaeri Jinja Shrine is located just at the entrance area of the valley. We saw the first Torii Gate of the shrine near this entrance area. After passing through the gate, we saw a small stream flowing by. We crossed a simple wooden bridge over the stream, and walked along the pathway for about 10 meters to reach the second Torii Gate located to our right side. We walked past this second gate and entered the sacred area of the shrine premises. Inside the premises to our right side, we saw a Temizuya which is a hand washing basin with a roof supported by four pillars. We washed our hands with water at the basin and purified ourselves. It is a symbolic act to clean the mind and body of impurity. Next, we walked up to the main prayer hall named Shaden located right across the second Torii Gate in the shrine premises. Shaden Hall is a small wooden building with intricately carved front area and the ceiling. Thin Shimenawa straw rope hung at the entrance of the hall. A deity of Water-God named Mizuhanome-no-kami is enshrined inside the hall. On reaching the front of the hall, I rang the bell located just outside the hall. Then I offered some coins into the offertory box located in front of the hall, clapped my hands twice, and prayed. I prayed for a safe environment as well as physical well being of my family and friends. I loved the serene atmosphere of the shrine premises. After finishing praying, I noted a pair of stone lanterns located on either side of the pathway in front of the hall, which further added to the tranquility of the shrine. I am standing in front of Shaden Main Prayer Hall. A pair of stone lanterns are seen on either side of the pathway leading to the hall. In front of Shaden Prayer Hall, towards its right side (orientation with respect to the prayer hall), we saw an elongated building named Nagadoko Hall inside the shrine premises. Nagadoko Hall is a wooden building with a roof and has only two walls. It is an open stage building with two walls absent, and is used as a meeting place for various ceremonies by the shrine staff. Several huge wooden Ema votive tablets with paintings of dragons and horses hang on the two walls of this hall. Some of the exhibited paintings are really very old. We loved viewing these Ema paintings. After visiting Dakigaeri Jinja Shrine, we continued walking along the paved pathway located adjacent to the shrine. 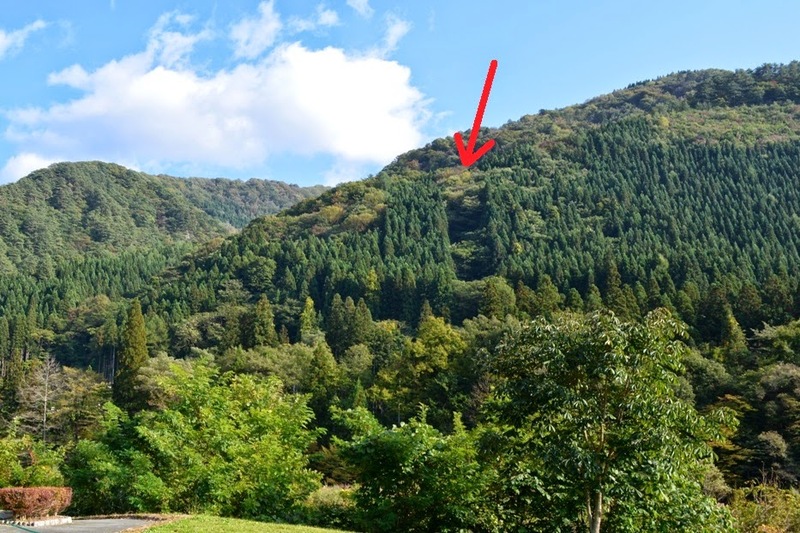 This section of the pathway is rather narrow and is located on the side of a mountain along with Tamagawa River flowing in the valley below. The pathway has wooden railings on one side to prevent visitors from accidentally falling into the river. The pathway was surrounded by lush green all around those days. From the pathway, we looked down into the valley and saw that the river looked stunningly beautiful with emerald colored water. After about 10 minutes of leisurely walking along the pathway, we reached Kami-no-Iwahashi Bridge located over Tamagawa River. As mentioned earlier, it is an 80 meters long red-colored suspension bridge that was built in 1926. It is the oldest suspension bridge in Akita prefecture. We loved viewing the spectacular sceneries of the valley while standing on either side of the bridge. The blue sky, the fresh green virgin forests, and the emerald colored river looked amazing. The view of the valley from this bridge is really magnificent. We walked across Kami-no-Iwahashi Bridge and reached the other side of Tamagawa River. Then we went down a few stone steps and reached the bank of the river. We walked along the bank and enjoyed the scenic views all around us. We saw that there were too many rocks and pebbles along the bank and realized that it was probably the dried-up portion of the riverbed. I touched the river water which was very cold but the clear emerald color of the water was a mesmerizing sight to behold. We stayed at the bank of the river for about 15 minutes and enjoyed the views. I am walking down the stone steps that lead to the bank of Tamagawa River. Kami-no-Iwahashi Bridge can be partly seen on the left side of the photo. I am walking along the bank of the river. Red colored bridge is seen on the left side of the photo. I am walking along the bank of the river. Many rocks and pebbles are seen. After crossing the bridge, there is a paved narrow path along the river in the valley that leads to Mikaeri-no-taki Waterfall and a few caves. But we skipped going to the waterfall this time. We returned back to the entrance area of the valley and had softcream at a shop located near the car parking area. Afterwards we walked back to the car parking area and returned home. We loved visiting Dakigaeri Valley and Dakigaeri Jinja Shrine. Thanks Uttpal K for your nice comment.